The advancement and integration of renewable energy resources is critical to our energy future. Currently, the United States is heavily reliant on fossil-fuel based electricity generation, which emits high levels of the most prevalent greenhouse gas, carbon dioxide. Increasing wind-generated electricity and integrating it into the electrical grid could significantly decrease reliance on fossil fuels and reduce greenhouse gas emissions. Offshore extreme-scale wind turbines have the potential to transform the wind energy market by dramatically increasing the availability of wind energy. However, current designs limit turbine size due to large mass and hurricane susceptibility as well as infrastructure obstacles like manufacturing, transport, and assembly. An innovative redesign of conventional wind turbines could open the door to significantly increase wind energy production at considerably lower costs. The team led by the University of Virginia (UVA) will design the world's largest wind turbine by employing a new downwind turbine concept called Segmented Ultralight Morphing Rotor (SUMR). Increasing the size of wind turbine blades will enable a large increase in power from today's largest turbines - from an average of 5-10MW to a proposed 50MW system. 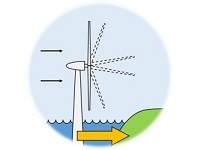 The SUMR concept allows blades to deflect in the wind, much like a palm tree, to accommodate a wide range of wind speeds (up to hurricane-wind speeds) with reduced blade load, thus reducing rotor mass and fatigue. The novel blades also use segmentation to reduce production, transportation, and installation costs. This innovative design overcomes key challenges for extreme-scale turbines resulting in a cost-effective approach to advance the domestic wind energy market. The team includes world's experts at the National Renewable Energy Laboratory (NREL) and Sandia National Labs (SNL) working with world-class faculty and students at the Colorado School of Mines, University of Colorado (Boulder), University of Illinois (Urbana-Champaign), and UVA. If successful, the team will develop the world's largest wind turbine design that could transform the wind energy market and enable the potential for integration of wind energy in the U.S. electrical grid, ultimately reducing reliance on fossil-fuel based electricity generation. Increased renewable energy resources will improve grid resiliency by making more options available. UVA's technology will enable more cost-effective, zero-emissions wind energy. This technology can dramatically reduce the cost of wind energy production, helping to lower the cost of power generation for consumers with no carbon generation or emissions.